GOSH!ABOUT: JBF GALA: Singapore’s Culinary Crossroads – GOSH!About: Fashion. Art. Music. Events. TV. Non Profits 'N' Lifestyle > Subscribe now! 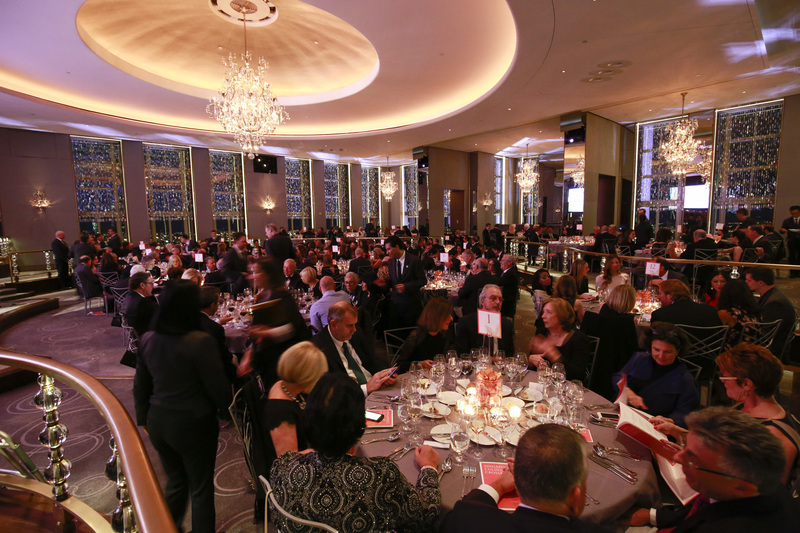 On Friday November 11, 2016, at the iconic Rainbow Room in New York City, the top culinary organization in the country, the JBF held its annual fall gala and fundraiser with this years theme, Singapore’s Culinary Crossroads presented by Singapore Tourism Board, which featured a mix of different cultural dishes created by some of Singapore’s and America’s finest chefs including Alfred Portale, Cat Cora, LG Han, Yew Eng Tong, and Cheryl Koh, along with Rainbow Room host chef Robert Aikens, and host pastry chef Kyung Kim. More than 200 guests were in attendance to enjoy the festivities. The Gala began with an elegant reception featuring cocktails by Employees Only, music by Joelle and the Pinehurst Trio, and a silent auction of over 100 exciting culinary and travel packages which raised close to $250,000 to support the James Beard Foundation’s mission and programs. Special appearances at tonight’s gala were His Excellency Burhan Gafoor, Ambassador and Permanent Representative of Singapore to the United Nations; Kershing Goh, Regional Director, Americas, Singapore Tourism Board; Ranita Sundra, Director of Attractions, Dining and Retail, Singapore Tourism Board, as well as inaugural JBF National Scholars recipients Earlene Cruz, Matthew Johnson, and Sarah McKeen and JBF Board of Trustees members Kim Bernstein, Peter Cameron, Bernardo Hernandez, John Kessler, Emily Luchetti (Board Chair), Nancy Lukitsh, Wenda Harris Millard, Cindy McLoughlin, Richard Perlman, Walt Richter and Frederic Seegal. The evening’s Dessert Lounge was amazing and so delicious, created by pastry chef Cheryl Koh (Tarte and Les Amis, Singapore) and host pastry chef Kyung Kim (Rainbow Room, NYC), who each presented a breathtaking array of desserts and petit fours, which ranged from Koh’s Singapore Sling Chocolate Egg Shooters to Kim’s delectable Matcha Cakes with Yuzu Curd. All through the duration of the after-dinner reception, we enjoyed sweet treats between sips of Michter’s US*1 American Whiskey and Foro Amaro, as well as espresso graciously provided by Lavazza. Founded in 1986, the James Beard Foundation celebrates, nurtures, and honors America’s diverse culinary heritage through programs that educate and inspire. A cookbook author and teacher with an encyclopedic knowledge about food, the late James Beard was a champion of American cuisine. He helped educate and mentor generations of professional chefs and food enthusiasts, instilling in them the value of wholesome, healthful, and delicious food. Today JBF continues in the same spirit by administering a number of diverse programs that include educational initiatives, food industry awards, scholarships for culinary students, publications, chef advocacy training, and thought-leader convening. The Foundation also maintains the historic James Beard House in New York City’s Greenwich Village as a “performance space” for visiting chefs. For more information, please visit jamesbeard.org. Get food news, recipes, and more at the James Beard Foundation’s blog. Follow the James Beard Foundation on Facebook, Twitter and Instagram. The Singapore Tourism Board (STB) is a leading economic development agency in tourism, one of Singapore’s key service sectors. Known for partnership, innovation and excellence, STB champions tourism, making it a key economic driver for Singapore. We aim to differentiate and market Singapore as a must-visit destination offering a concentration of user-centric and enriching experiences through the “YourSingapore” brand. For more information, please visit www.stb.gov.sg orwww.yoursingapore.com.